You want me to predict what? 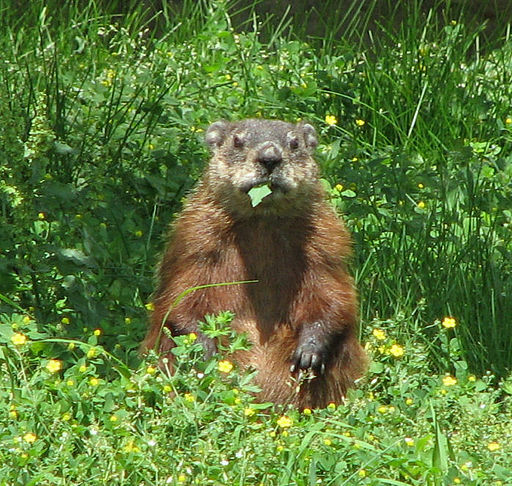 Apparently the immortal groundhog Punxatawny Phil saw his shadow today, so six more weeks of winter. Well, duh, it’s only February. Of course the way winter is going this year, I’m not so upset about that. It was 70 degrees in northern Virginia yesterday! What is it with all of these prophets in rodent form anyway? In addition to Phil, there’s Dunkirk Dave (Dunkirk, NY) and Staten Island Chuck (what, they couldn’t come up with an alliteration in Staten Island? Stan, Steve, Stewart…). I can’t imagine why so many towns are in the meteorology-by-marmot business, but I’m guessing all of these critters bring tourists. Why else would there be so many towns with psychic groundhogs? Maybe they should branch out and start predicting economic recovery, election results, and sports. Try out new animals, like Paul the (now deceased) octopus who predicted the 2010 World Cup Soccer games. How about Rodney the raccoon for NASCAR, Hank the hog for the Superbowl, and Ginny the giraffe for cricket? Whatever happens with the weather, I hope the rest of winter is good to you. Happy Groundhog Day! I just ask my moustache, works every time. Winter. What winter? Down GA way we started spring about two weeks ago. It is 74* here today. The recent dusting of pine pollen has us all coughing and sputtering and looping through the Docs. office for free samples of something to clear our heads. Anything to avoid another box of Claritan. Oh no, Curtis. I guess there’s a downside to everything, right? Of course, I’m usually looking up. 😉 I hope the sniffles elude you so you can enjoy that nice weather! Just realized you are getting into the comedy game with your Groundhog picture caption, nicely done. Zinger. Thanks, Rich. For the compliment, and for stopping by! Was in Fairfax all week and have to say the weather was great!! While sitting at the hotel this morning getting ready to fly back to Houston, received an email from a friend in western Minnesota saying it was the warmest winter in his memory. Houston proper sunsets are tame…. Best sunsets require bodies of water for coloration and structure…. Great lakes, Gulf, and the like, are excellent. To say nothing of the fact that when landing, the rain and fog were so bad the we couldn’t see the runway, much less adjacent airplanes!!! I have a story for everything. Flew into Houston on one of Delta’s “regional” Styrofoam tubes with a pair of Rolls-Royce AE’s duct taped to the fuselage. I don’t think they have anymore of these in service. No one but test pilot types would buy a ticket to fly. To this day I can’t figure out wny I thought I needed to be on that plane that day. Throw wind into your mix and that would finish the description of the landing. I don’t think I ever gave my heart and all my assets to Jesus as many times in as short a period of time in my life. One thing we all knew for sure, that tube was coming down. LOL, just realized my profile pic is the sunset you were referencing!! That was taken in Anniston, Alabama, it was a sunrise. Odd, I find that sunrise seems to not require large bodies of water to enhance. Maybe the colder, denser morning air raises the relative humid and creates a more colorful display? 🙂 It is a good pic. I love photography. I have a number of shots I took of cloud formations similar to the one you have pictured. One in Waco, TX. The other in Austin. Both are sunsets. The intensity, and contrast is off the chart. Hope your flight back was okay, Tony. Enjoyed the photography discussion, guys. 😉 Arizona has some pretty awesome sunsets from all the dust in the air. I agree, water makes for some of the best photos. They did have some kind of camel in NJ predicting the Super Bowl. Of course he predicted the Giants. If it’s any consolation, Staten Island Chuck predicted early spring. Oh, I hadn’t heard of the camel, Mary. That’s original. 😉 Honestly, I’ll just take more of what we’ve been having. Winter’s been wonderfully mild here in VA this year for the most part. Dave: My husband caught the movie on TV last week. The edited version just doesn’t do it justice. They took out all of the scenes where he learned lessons that made him a better person. Made it feel like he didn’t deserve his happy ending.